Courtesy California Institute of Technology. Astrophysicists at the California Institute of Technology were reluctant to predict the existence of a new planet in our solar system, but NSF-powered supercomputer simulations left no other possibility. Planet 9: The latest example of science as a team sport. 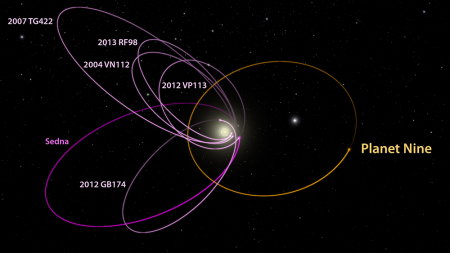 Clustering objects in the far solar system prompted new investigations. NSF-powered computer simulations predict the existence of a new neighbor planet. Observation will confirm the predictions and retell the origin of our star system. Isaac Newton once said “If I have seen further, it is by standing on the shoulders of giants.” Brian Malow’s analysis notwithstanding, no, Newton did not believe in giants. What Newton meant is that scientific discoveries seldom happen overnight, and the image of the lone scholar is a myth. Rather, progress is the product of teams toiling across decades, slowly building on the findings of others. This collaborative method has been the slow and steady path to knowledge, and today includes a heavy reliance on computation. The recently postulated Planet 9 is a product of the collaboration Newton was talking about. There goes the neighborhood. Planet 9 is predicted by supercomputer simulations of 4 billion years of solar system evolution. Discovery of Neptune similarly relied on theoretical prediction. Courtesy California Institute of Technology. In 2003 Michael Brown, Chad Trujillo, and David Rabinowitz kickstarted Planet 9’s arc of discovery when they discovered Sedna, a small, reddish dwarf planet at the far reaches of our solar system. Spurred by this discovery, in late 2012 Trujillo and Scott Sheppard spied another small red planetoid in the inner Oort cloud using the Dark Energy Camera (DECam) at the Cerro Tololo Inter-American Observatory (CTIO) in Chile. The CTIO is part of the U.S. National Optical Astronomy Observatory (NOAO) operated by the Association of Universities for Research in Astronomy (AURA) under cooperative agreement with the US National Science Foundation (NSF). Trujillo and Sheppard confirmed their Sedna-like object in the fall of 2013 through further observations made with the Inamori Magellan Areal Camera and Spectrograph (IMACS) on the Magellan Baade telescope, at the Las Campanas Observatory, also in Chile. They corroborated these observations by reviewing archival images of the same celestial area taken in 2011 at the Canada–France–Hawaii Telescope, located at the summit of Mauna Kea, Hawaii. Observing these Kuiper Belt objects (KBOs) prompted Trujillo and Sheppard to note a peculiar clustering of some of these KBOs, objects that would not collect unless some unseen mechanism was forcing them to align. It was from this starting point that Konstantin Batygin and Michael Brown reanalyzed Trujillo and Sheppard’s observations to come up with an alternative explanation for this clustering — one they didn’t want to make, however. 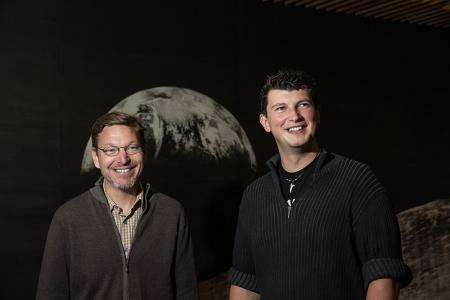 Drawn to astrophysics like satellites to a planet, Batygin and Brown bring two very different approaches to their science. Brown, the senior researcher, (in)famous for demoting Pluto, makes predictions based on what can be seen. On the other hand, Batygin revels in cool calculations, and is comfortable making predictions based on theoretical physical dynamics. As it turns out, their binary approach has yielded one of the most exciting astronomical discoveries in the modern era. 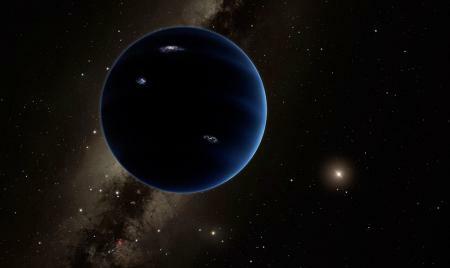 After exhausting every possible gravitational effect they could find, the evidence led them to postulate the existence of a hidden perturber lurking in the solar system shadows: Planet 9. But since humans have been observing the nighttime sky for thousands of years, how is it that we could have missed a planet in our own solar system? According to Batygin, the answer comes down to the enormity of the space involved. Our solar system is a really, really big place, and this postulated planet is exceptionally far away from us. Still unobserved, Planet 9 is within the gravitational influence of our sun, completing one revolution in approximately 20,000 years. That means its orbital clock runs so slowly that it has not been around the sun since our last ice age. Batygin’s computer models indicate the mass of the planet will be around 10 times that of Earth, and will likely be made of the same material as Uranus and Neptune. Batygin and Brown’s prediction has been the product of a long line of collaborations, but the work could not have been completed without the heavy lifting provide by supercomputers at California Institute of Technology (Caltech). There, Batygin employed the Fram supercomputer at CITerra for four months to simulate four billion years of solar system evolution. Fram consists of almost 4,000 cores, running on the NSF-funded Rocks software environment, with 512TB of Lustre file storage. Batygin and Brown are excited about the discovery and if their prediction turns out to be correct, not only will it be only the third planet discovered in modern times, its discovery will also shed light on the history of our solar system, and how we compare with other galaxies in the universe. For now, their prediction awaits the next scientist to discover it. Will it be you?